1. 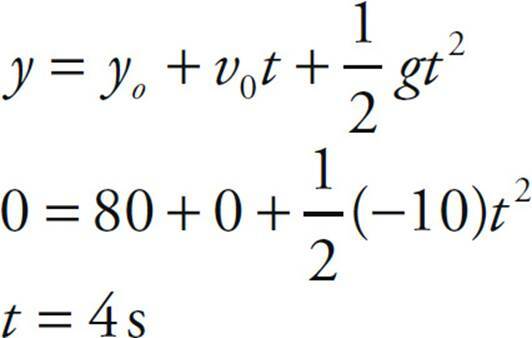 E The initial velocity is negative, so the initial displacement must start out negative. The object also continues at a constant speed after time t1, so that position vs. time should be a straight line with a positive slope at this time. (E) is the only answer choice that meets these two conditions. 2. B When an object is dropped its initial vertical velocity is zero. 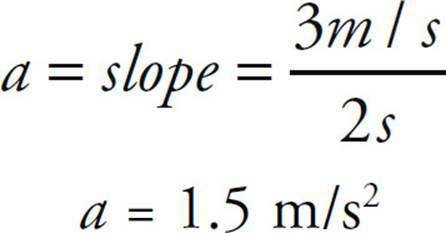 We can solve for the time to land using the following constant acceleration equation and plugging in appropriate values. 3. D The direction of the change in momentum of an object will be the direction of V. The resultant of V2 – V1 is shown below. 4. 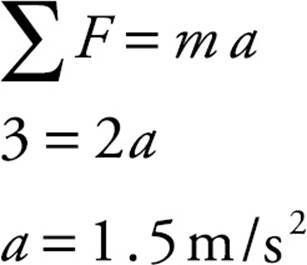 B The acceleration of the 2m mass is the same as the acceleration of the m and 3m mass because they are connected to each other. 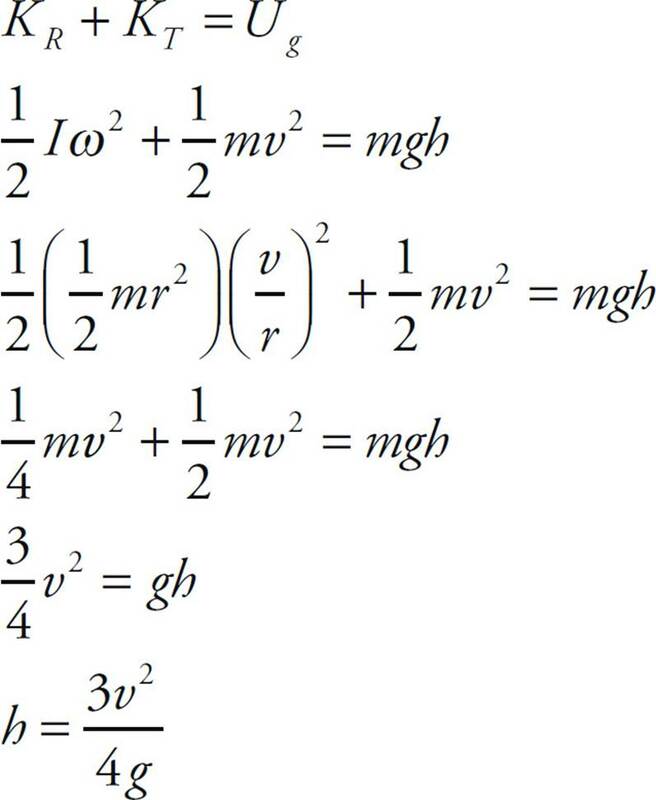 Use Newton’s Second Law for the entire system to solve for the acceleration. 5. B Read the force directly off the graph. 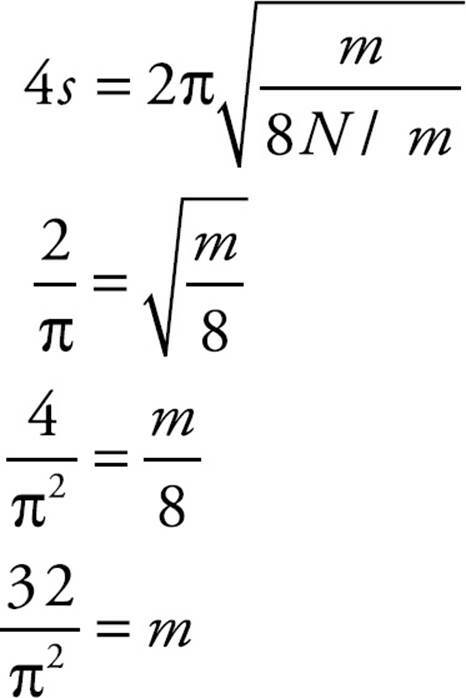 At t = 2 s the force is 3 N. Use Newton’s Second Law to solve for the acceleration. 6. C We will use the impulse-momentum theorem here. We cannot use the constant acceleration equations with the acceleration from question 5 because the acceleration is not constant. The area between the graph and the x-axis is the impulse. 7. D We will use the Law of Conservation of Energy for this problem. The cylinder has rotational and translational kinetic energy as it rolls along the horizontal surface. All of that energy will be converted into gravitational potential energy when it reaches its maximum height up the ramp. 8. A Again we will use the Law of Conservation of Energy. The easiest way to determine which object will reach a greater height is to determine which object has more kinetic energy as it rolls along the horizontal surface. If both the cylinder and the hoop have the same velocity then the hoop will have more total kinetic energy because it has a greater rotational inertia. The calculation below shows the calculation for the height which also shows that the hoop reaches a greater height. While both (A) and (D) indicate that the hoop reaches a greater maximum height than the cylinder, (D) is incorrect as the cylinder reaches 3/4 the height of the hoop. 9. E The mass is in static equilibrium so the net force in all directions is zero. 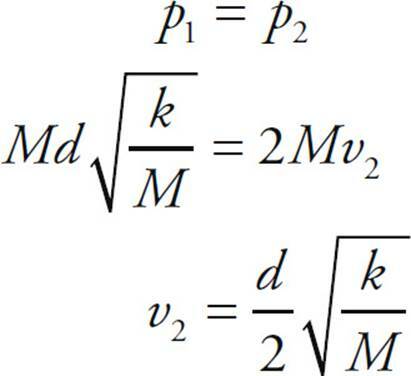 Using the sum of the forces in the vertical direction, one can conclude that the vertical component of the slanted cord must equal the force of gravity of the mass. That produces the following triangle for the tension in the slanted cord. Using trigonometry we can solve for FT.
10. D For all three of these problems, (A) cannot be the correct choice because the gravitational force mg must be directed straight down. (B) cannot be the correct choice because the normal force N must be perpendicular to the surface. If the box is going up the incline then the frictional force must be directed down the incline, which is only true for (D). 11. 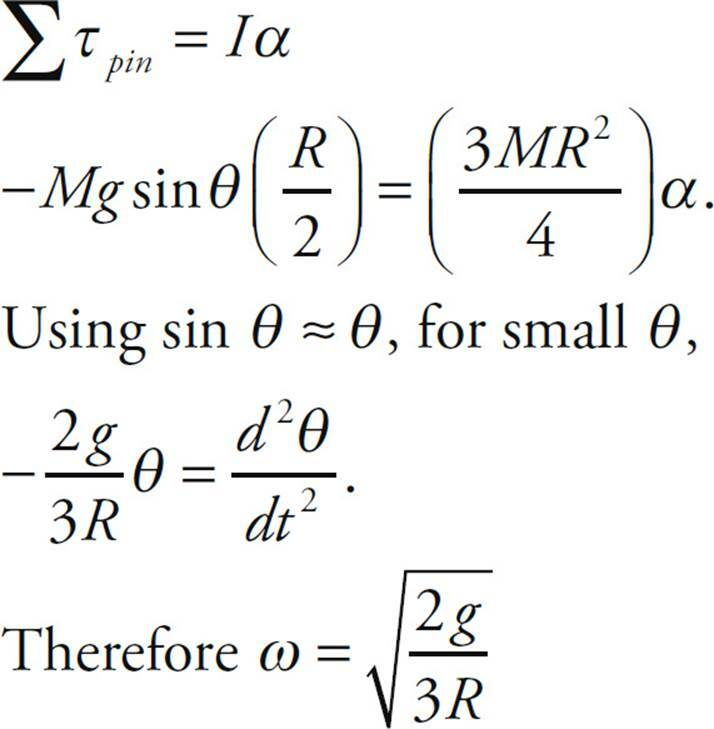 C For all three of these problems, (A) cannot be the correct choice because the gravitational force mg must be directed straight down. (B) cannot be the correct choice because the normal force N must be perpendicular to the surface. If the box is moving at a constant velocity the net force in the x-direction, along the incline, must be zero. This is true only for (C). 12. 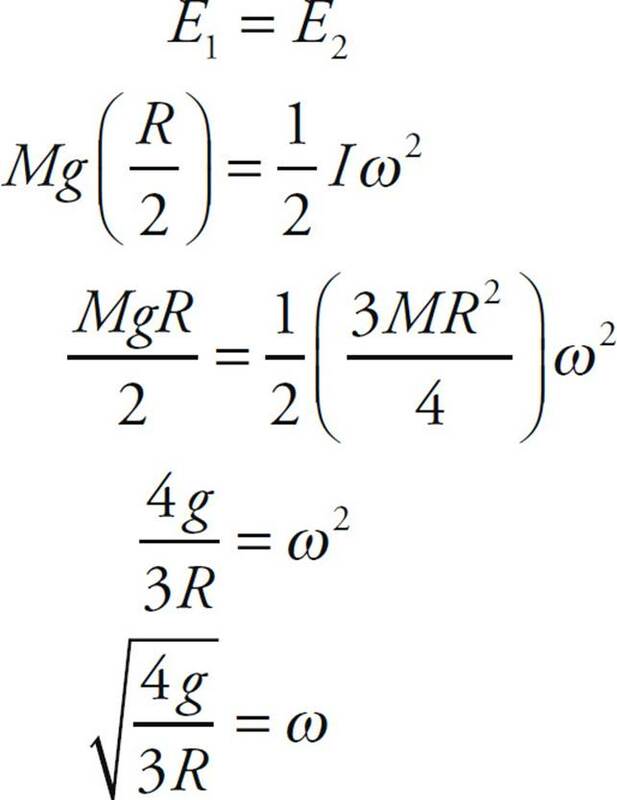 E For all three of these problems, (A) cannot be the correct choice because the gravitational force mg must be directed straight down. (B) cannot be the correct choice because the normal force N must be perpendicular to the surface. If the box is speeding up while moving down the incline then the net force must be directed down the incline, and the frictional force must be directed up the incline to oppose the motion. This is true only for (E). 13. 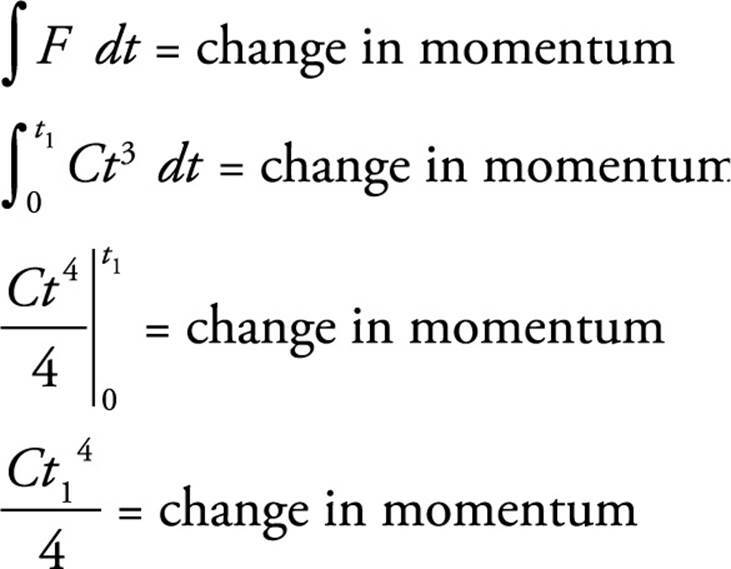 E According to the impulse-momentum theorem, the change in momentum of an object is equal to the impulse on an object. 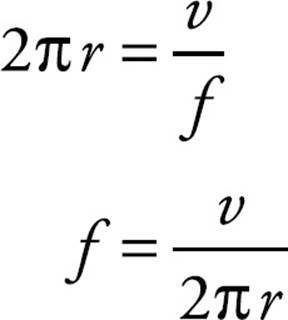 The impulse on an object is equal to the integral of F•dt. 14. B To reduce this elliptical orbit to circular the spaceship must slow down. To accomplish this, the engine burst must be in the same direction of the velocity which will cause the spaceship to accelerate in the opposite direction as per Newton’s Third Law of Motion (action/reaction). This will cause the spaceship to slow down. The velocity at point P is directed to the left, so the engine burst must be to the left. 15. A The normal force of the track would point toward the center of the circle for the entire time the motorcycle was in the circular loop and the velocity would always be tangent to the path. The normal force and the displacement of the motorcycle are always perpendicular to each other. Therefore the work done by the normal force would be zero since work is the dot product of the force and the displacement. 17. B When objects stick together, a perfectly inelastic collision has occurred. For this situation kinetic energy is not conserved. This eliminates (C) and (D). Linear momentum is conserved when the net force on the system is zero. In this situation the hinge in the bar is exerting a force on it prohibiting it from translating to the right. Therefore linear momentum is not conserved. This eliminates (A) and (E). 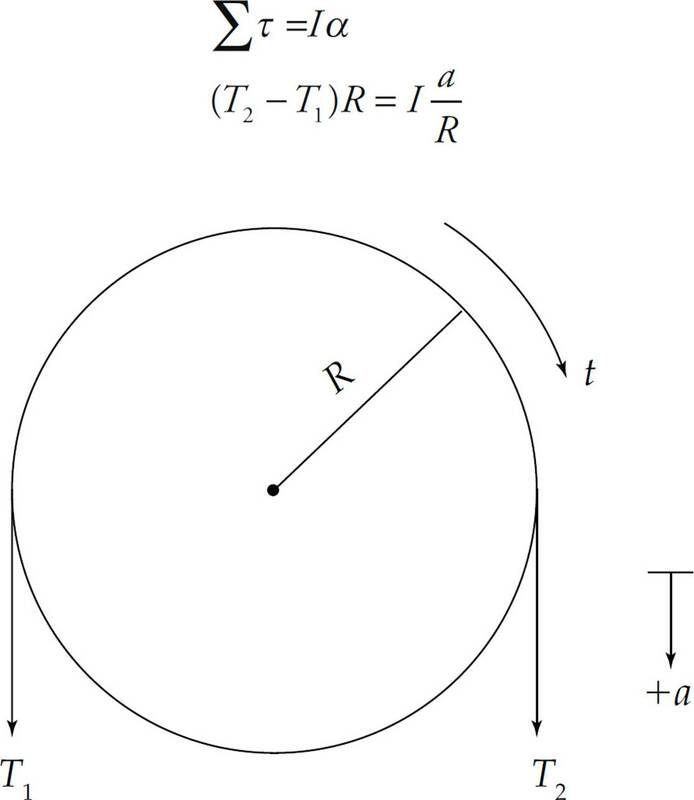 Angular momentum is conserved when the net torque on a system is zero. The force exerted by the hinge provides no torque because the lever arm is zero. Therefore (B) is correct. 18. B The period for a spring-mass system is given by the equation . 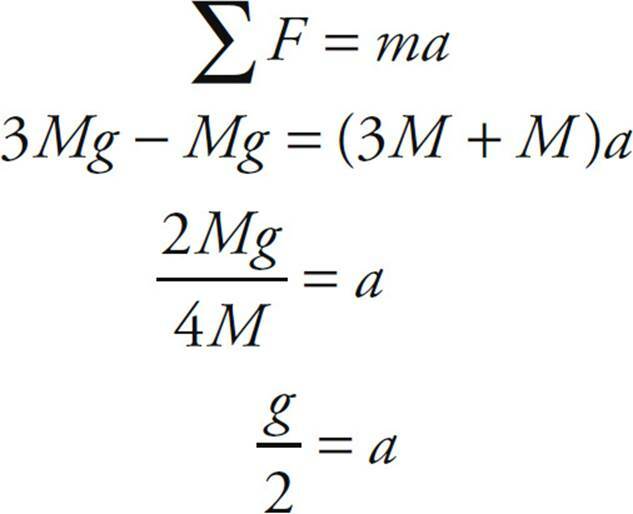 Use that equation to solve for the mass, as shown below. 19. C The equation for an object undergoing simple harmonic motion will be of the form x = A cos(ωt + f), where A is the amplitude, ω is the angular frequency and f is the phase constant. None of the solutions involve the phase constant, so we will ignore that part of the equation. 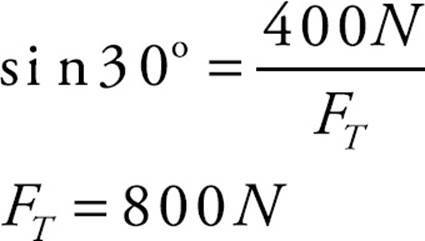 The amplitude of the oscillation is 5 cm, which is 0.05 m. This eliminates (D). 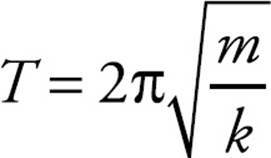 The angular frequency can be calculated by using the fact that the period is 2π divided by the angular frequency. 20. 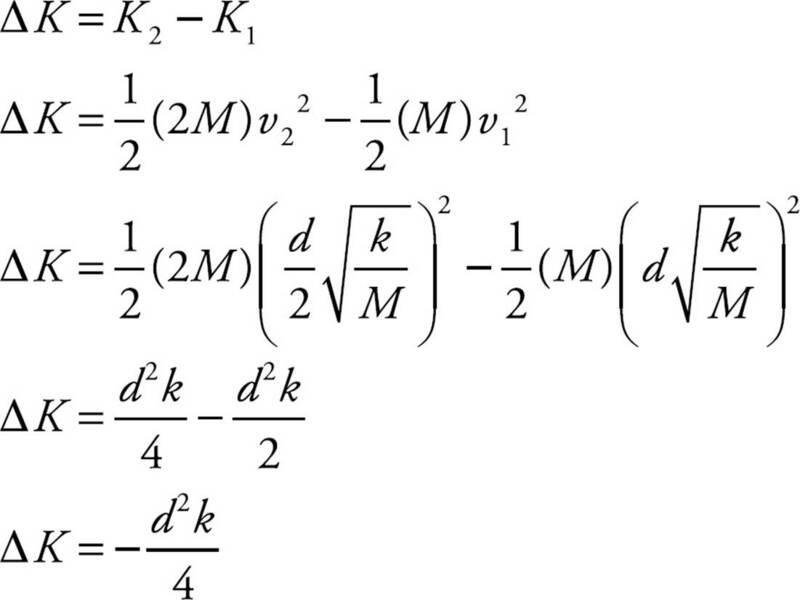 E Apply Newton’s Second Law to the entire system to determine the acceleration of the system, and therefore each mass. 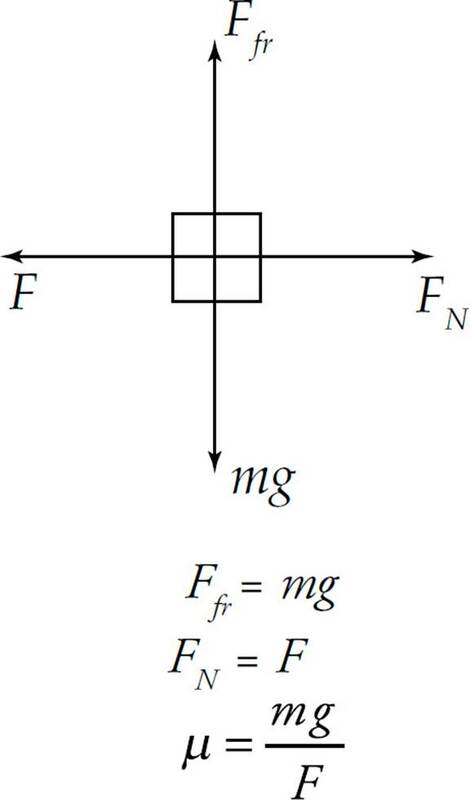 The net force on the system is the gravitational force on mass 3M minus the gravitational force on mass M because they are trying to cause the system to move opposite directions even though they both point downward.Fg for the 3M mass is trying to move that mass down, which would cause mass M to move upwards, and Fg for mass M is trying to move that mass down, which would cause mass 3M to move upwards. Therefore these forces must be subtracted from each other to determine the net force. The solution is shown below. 21. A For a spring that is not linear (i.e., does not obey Hooke’s Law) the energy stored is not kx2. The magnitude of the energy stored will be equal to the magnitude of the work done to stretch the spring to x1. The steps to calculate the work are shown below. 22. D Applying the Law of Conservation of Linear Momentum tells us that the total momentum of the system after the collision is equal to the total momentum of the system before the collision. 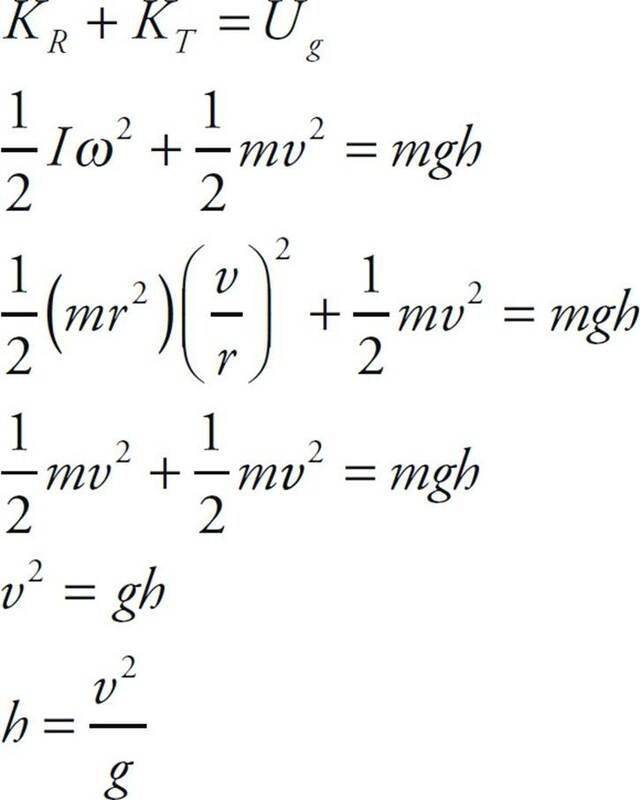 Momentum can be calculated by multiplying the mass times the velocity for each skater and adding the vectors as shown below. 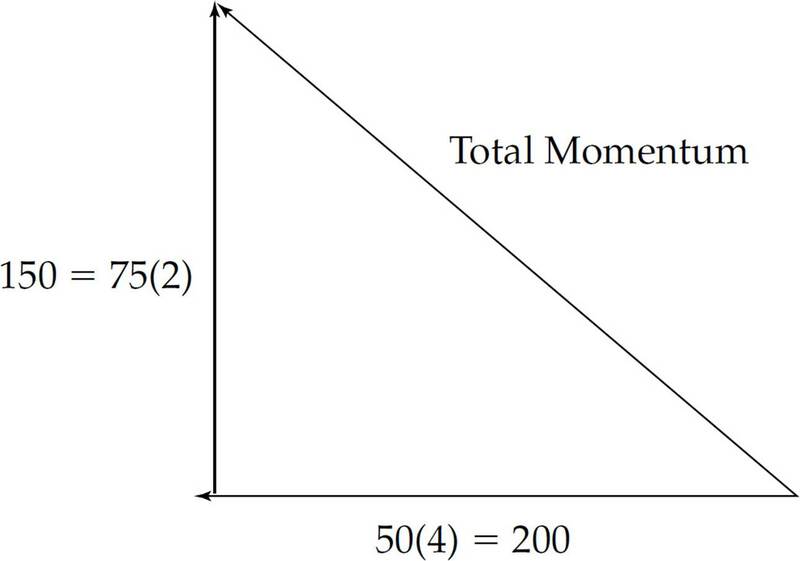 You can use the Pythagorean theorem to solve for the total momentum, or realize this is a 3-4-5 right triangle, so the total momentum is equal to 250 kg⋅m/s. 23. D When objects stick together, a perfectly inelastic collision has occurred. For this situation kinetic energy is not conserved. This eliminates (B), (C), and (E). Linear momentum is conserved when the net force on the system is zero, so only (D) combines all this information correctly. 24. C Acceleration is the second derivative of the position. 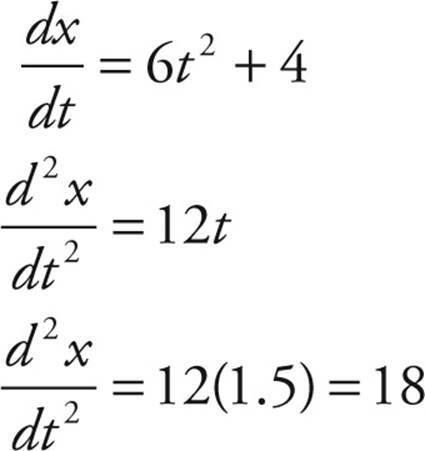 Take the derivative of the position function twice and then plug in t = 1.5 s to get the correct answer, as shown below. 25. C There is no net force on the system of the two astronauts, the rope, and oxygen tank, so the total linear momentum of the system will be conserved. Immediately after the throw, Astronaut A will recoil to the left and make Astronaut B also come to the left since they are attached by a rope. After Astronaut B catches the tank the total linear momentum of the system must return to zero since it was initially zero before the tank was thrown. If the linear momentum is zero when the tank is caught all objects must come to rest because Astronauts A and B move together. Combining these two pieces of information means (C) is correct. 26. C The pulley will rotate because there is a net torque on the pulley due to tension 1 and tension 2. Apply Newton’s Second Law for rotation to the diagram below and then substitute α = . Take clockwise and downward to be positive, and remember that torque is the cross product of force and distance. 27. B The force of gravity acting between the masses can be calculated using Newton’s Law of Gravity: When the test mass is outside of the sphere it is an inverse square relationship, so (C), (D), and (E) can be eliminated. 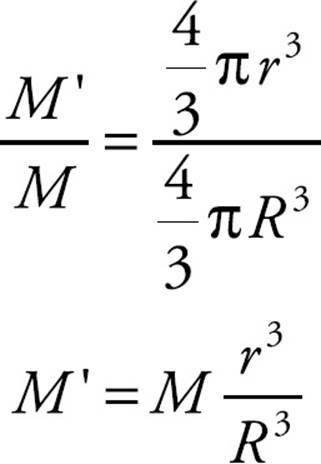 When the test mass is inside the sphere, at a radius r < R, the sphere still attracts the test mass with amount of mass, M’, that is at a radius less than the test mass. 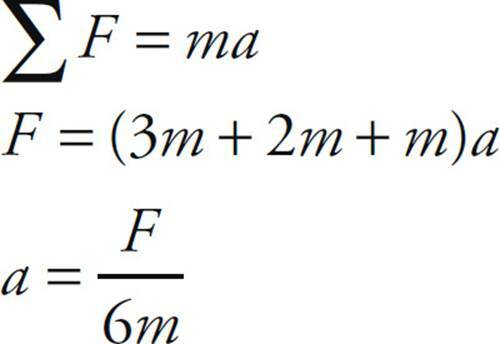 M’ is proportional to the total mass by the volume contained compared to the total volume as shown in the following equations. 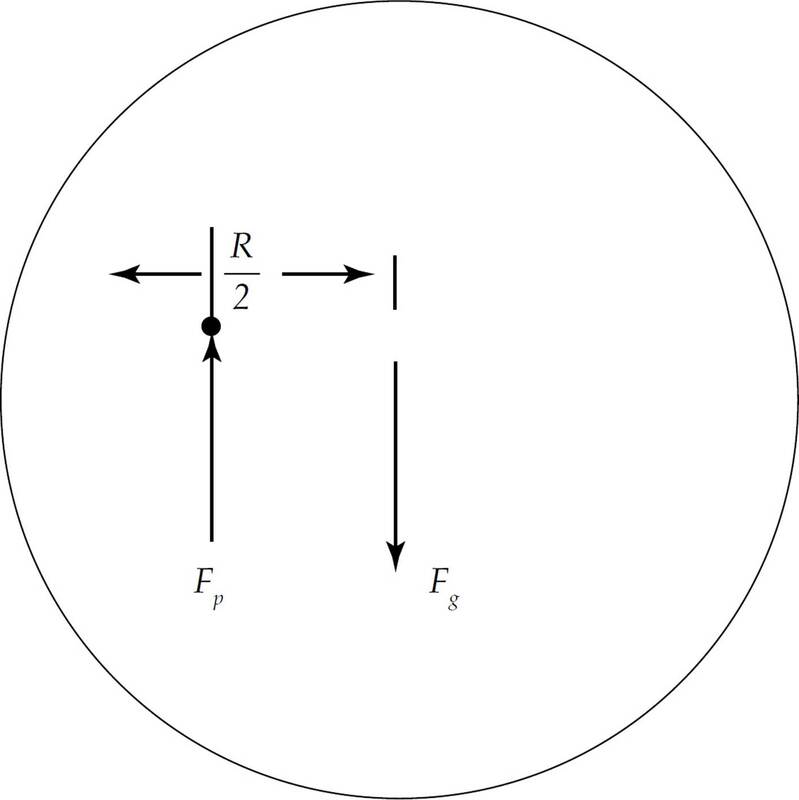 This produces a gravitational force that is linear for the region r < R, as shown below. Therefore, (A) can be eliminated. 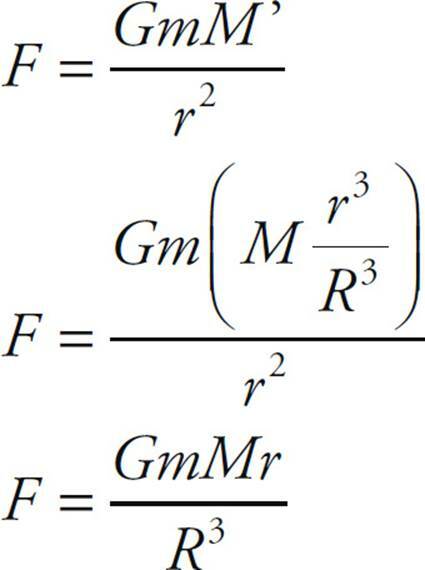 This can also be found conceptually by realizing that the net gravitational force will only be zero where r = 0. 29. A For small amplitude oscillations, the period of a pendulum is given by the equation, . This indicates the period is independent of the amplitude, so the new period will equal the previous period. 30. A Power is equal to the rate work is done and also the dot product of force and velocity. 31. C The energy of the oscillating spring-mass system will remain constant. When it is pulled down 10 cm the energy will be stored in the spring, and when it passes the equilibrium position, all of the energy will be kinetic energy. 32. D The constant kinematics equations ignore the air resistance that decreases the total mechanical energy of the ball as it falls. The force due to air resistance also increases the faster the ball is going, so the force is increasing with time. This would make the acceleration of the ball begin at 9.8 m/s2 and then decrease as the ball falls. This eliminates (C). The ball is rigid so it will not change shape when falling, which eliminates (A). The acceleration of gravity will be constant over the 6 meters that the ball falls, so this eliminates (B) and (E). Therefore (D) is left and is correct because the fall is speeding up at a decreasing rate of acceleration. 33. C The acceleration of the object will be due to gravity and air resistance. Air resistance is proportional to the velocity of the object. Since air resistance decreases the total mechanical energy of the object, the greatest velocity will occur at the point closest to the initial launch, point A. The greatest acceleration will occur when the air resistance and gravity are in the same direction and when the object is traveling the fastest. This is also at point A. Therefore (C) is correct. 34. B The acceleration of the center of mass is zero because the disk is rolling at a constant velocity. The contact point, P, is instantaneously at rest and then moves upward, which implies the acceleration is upward. Combining these two pieces of information indicates (B) is the correct answer. 35. 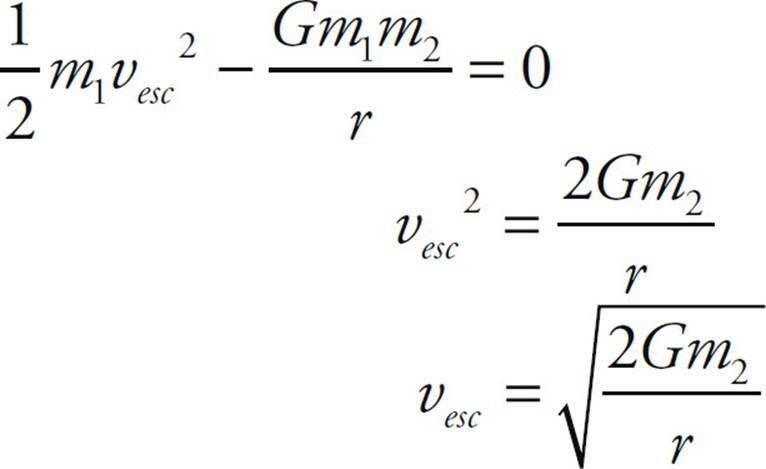 E The escape velocity for a planet can be determined by making the total energy (kinetic energy plus gravitational potential energy) equal to zero. This implies that the spaceship has escaped from the gravitational pull of the planet (i.e., reached infinity) with no more velocity. This calculation is shown below. 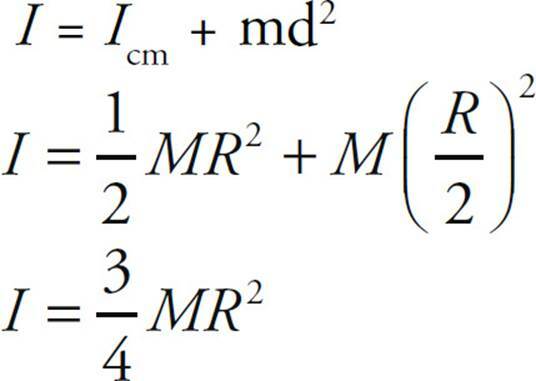 Examining the last equation, one can see that the effects of doubling the mass and doubling the radius will cancel each other out. Therefore the escape velocity will remain v0. 1. (a) Use Conservation of Energy since all of the energy stored in the spring will be transferred into kinetic energy of block A. 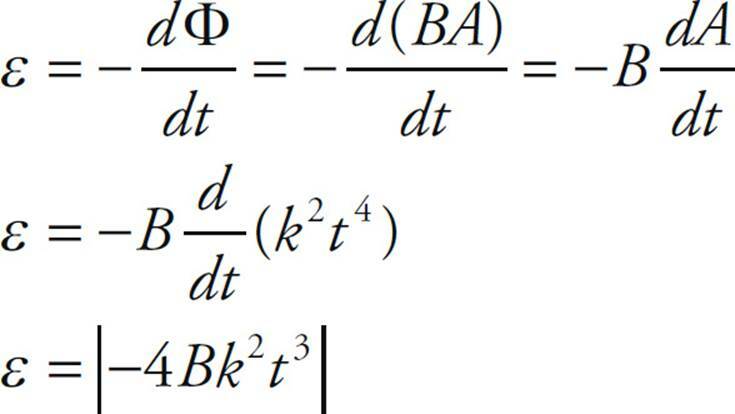 Realize the compression of the spring is given as d.
(b) Use Conservation of Linear Momentum for the collision. During a perfectly inelastic collision the two blocks stick together and continue at the same velocity. 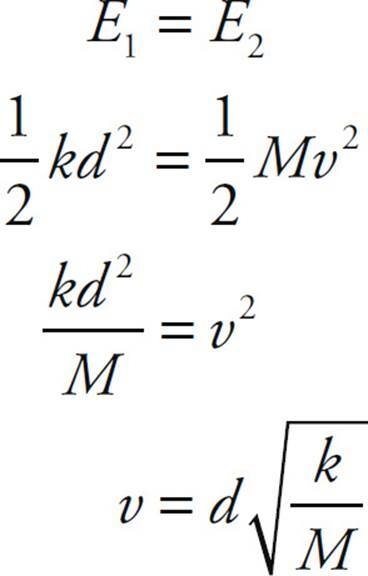 (c) The change in the kinetic energy during the collision is given by K = K2 – K1. (d) Now the blocks are traveling along a curved path and at the top of the hill they are traveling with the same velocity as in (B) since it is at the same elevation. They are also traveling in circular motion at the top of the hill. The free-body diagram for the blocks is shown on the next page. The gravitational force is pointing toward the center of the circle, so it will be positive and the normal force is pointing away from the center of the circle, so it will be negative. 2. (a) The acceleration of the system is equal to the slope of the velocity-vs.-time graph. One might try to use Newton’s Second Law to calculate the acceleration, but for a laboratory problem, one can almost always use the data or graph given. (b) According to the problem, tension is the only force causing the cart/force sensor to accelerate. A free-body diagram of the cart/force sensor is shown below. Use Newton’s Second Law to solve for the tension. (c) In reality, friction is opposing the motion of the cart. 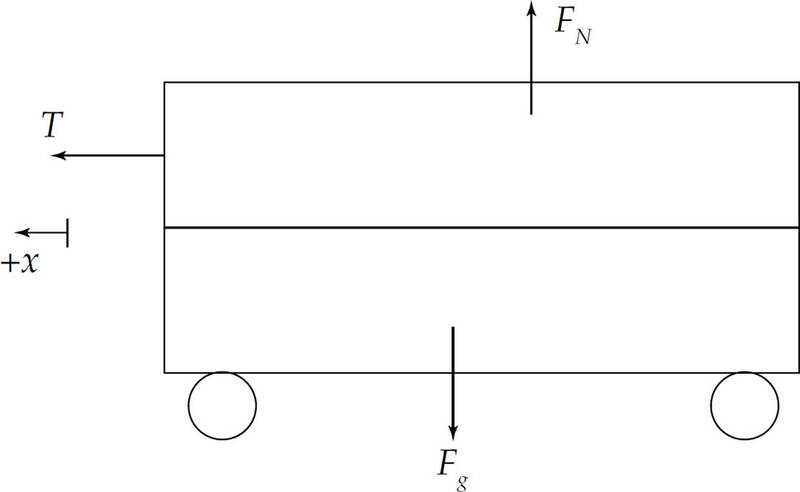 Therefore the tension in the string would have to be greater than the value in (b) to cause the cart to have the acceleration calculated in (a) to overcome friction. 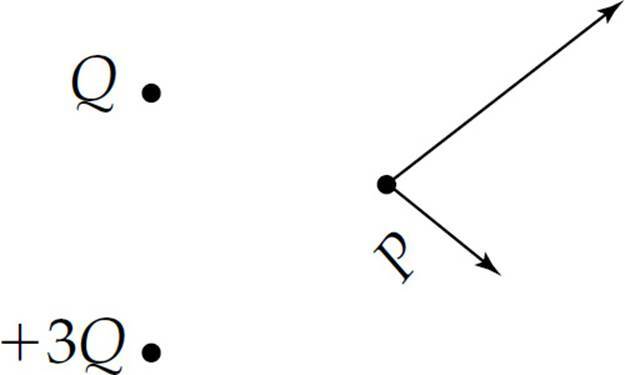 (d) Consider the three free-body diagrams below. One is of the pulley, one is of the hanging mass, and one is of the cart/force sensor. Use the motion detector to measure the velocity of the cart and find the acceleration of the cart, and also the hanging mass since they are attached, by taking the slope of the v vs. t graph. Use the force sensor to measure T1. Measure the radius of the pulley with the meterstick. 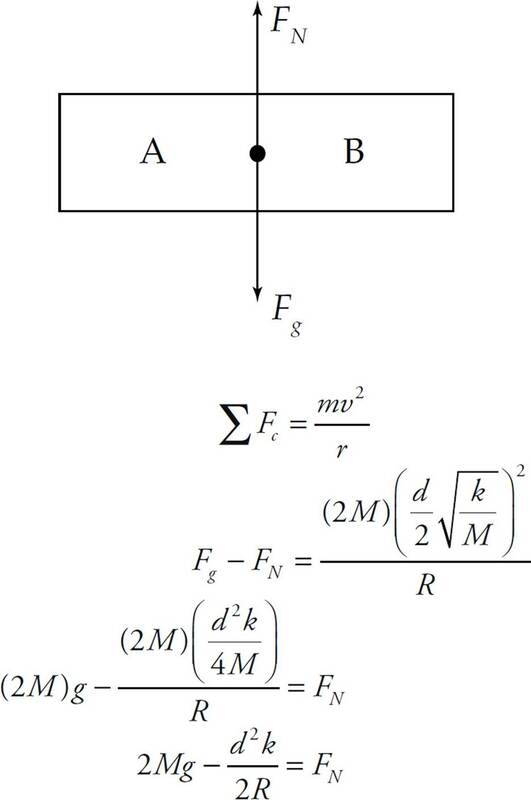 Apply Newton’s Second Law to the hanging mass since you already know Fg2 and its acceleration, to determine T2. 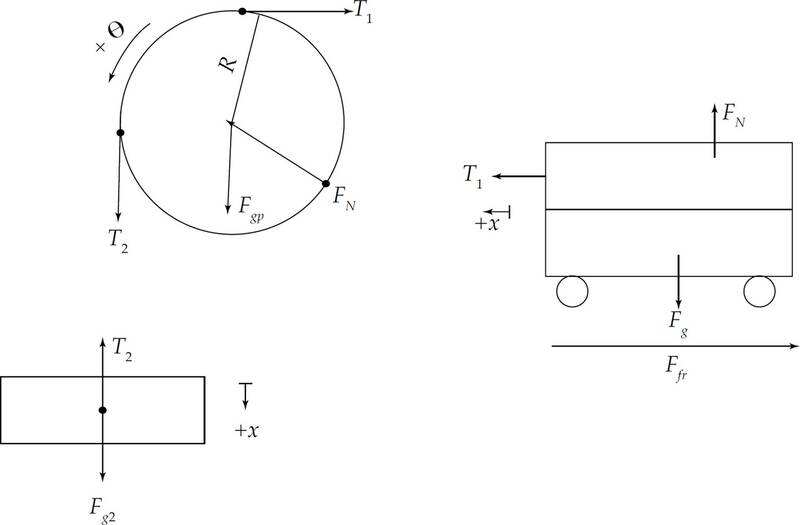 Apply Newton’s Second Law of Rotation to the pulley, to determine the rotational inertia of the pulley as shown below. 3. (a) Use the parallel axis theorem to determine the rotational inertia of the object about the pin. (b) When the object is first released, gravity provides a torque about the pin causing the disk to rotate about the pin. A free-body diagram for the disk is shown below. Use Newton’s Second Law of Rotation about the pin to determine the angular acceleration. (c) Use the Law of Conservation of Mechanical Energy to determine the angular velocity at the vertical position. All the initial gravitational potential energy is converted into rotational kinetic energy. 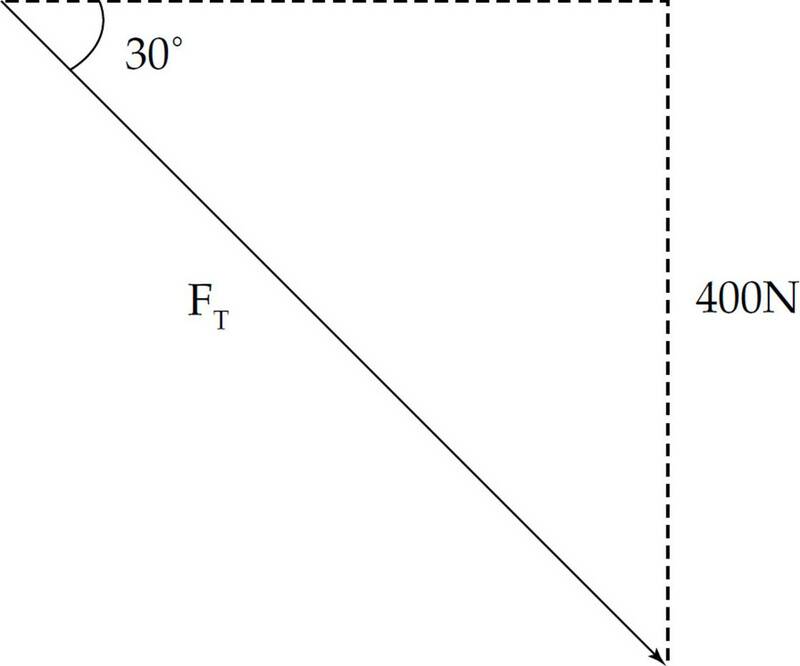 The center of mass falls half the distance of the radius. (d) Now the disk is undergoing simple harmonic motion because it is undergoing small angle oscillations. Derive a differential equation of the form , to determine ω. Start with Newton’s Second Law of Rotation to end up with a differential equation because . 36. E The equivalent capacitance of capacitors connected in parallel is the sum of each capacitor. 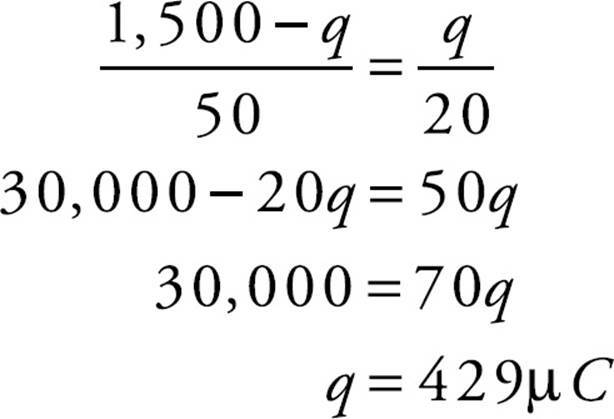 Therefore Ceq = 3 + 3 + 3 = 9µF. 37. D The rate energy is being used is equal to the power. For an electrical device P = IV, so P = (120)(2) = 240 W.
38. E The flux is proportional to the number of field lines that pass through the surface of the sphere. Since the background electric field E is uniform, every background field line that enters the sphere also exits the sphere. Therefore, it has no contribution to the flux. The field lines from the +2Q charge will radiate outward and every field line that exists due to the +2Q will pass through the sphere, regardless of R. Therefore, the flux only depends on the value of Q. This is in accordance with Gauss’s Law. 39. D The potential difference can be calculated using the equation that relates the potential difference to the electric field, . The limits of the integration will be from 0 to 5, because the radius is 5 for the point (3, 4). 40. C Determine the direction of the force on the charge using the right-hand rule. Consider the leftmost point of the circle. 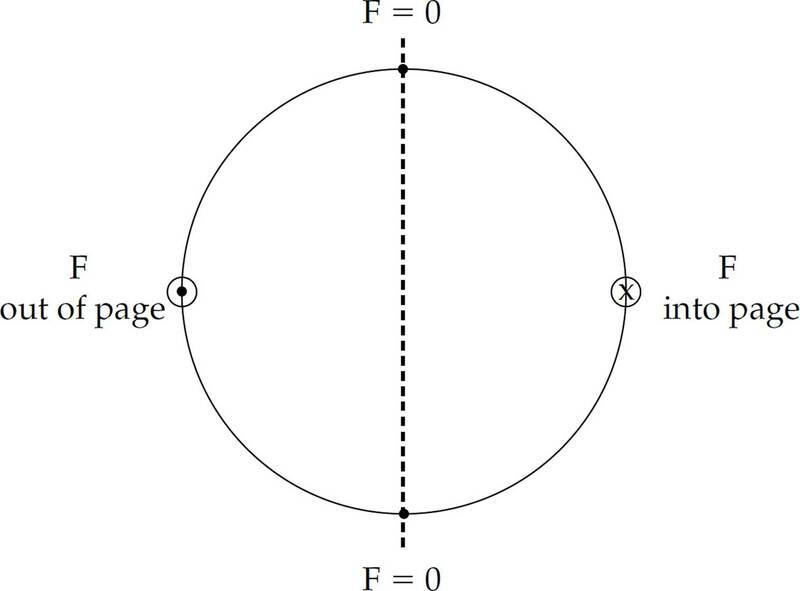 The force must be toward the center of the circle, to the right, and the magnetic field is out of the page, so the velocity must be up. This indicates the particle is moving clockwise. However, the right-hand rule gives the direction for a positive charge. Since the actual charge moving is negative, the direction should be reversed. Thus, the negative charge is moving counterclockwise. 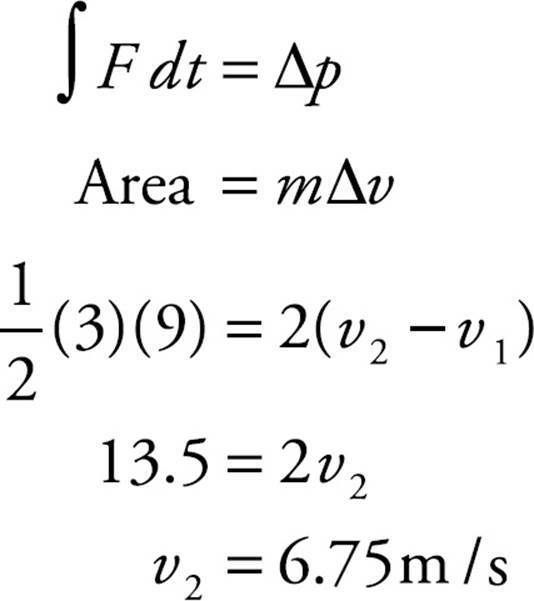 The force on the charge is F = qvB, and use Newton’s Second Law to solve for the acceleration as shown below. (C) has these two pieces of information correct. 41. D For a particle traveling in uniform circular motion, 2πr = vT because the particle travels one revolution in one period. The period is the inverse of the frequency. Applying this information and solving for f is shown below. 43. D The electric field is uniform in between the plates, so the force and the acceleration are constant. Relating the potential difference to the electric field gives us V = – Ex, where x is the separation of the plates. The definition of the electric field is the force divided by the charge. 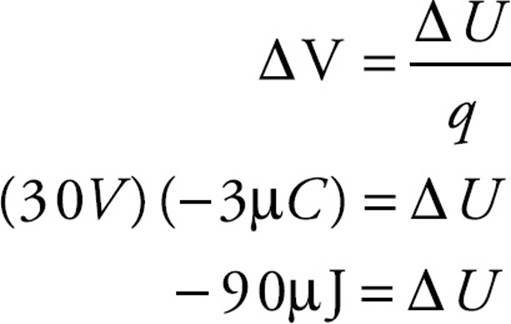 Use these two pieces of information and Newton’s Second Law to solve for the acceleration in terms of V.
This shows the acceleration is directly proportional to the potential difference V.
44. E Ampere’s Law is . For an ideal solenoid the magnetic field is uniform and directed along the central axis within the solenoid and zero outside. In this case only segment bc contributes to the integral because ad is outside the solenoid where the field is zero and ab and cd are perpendicular to the field, so the dot product of those segments with B is zero. The number of times the current will pass through our path is equal to the number of coils in the solenoid. 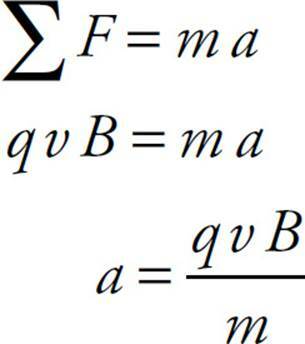 This gives us the equation B(x) = μ0NI. 45. 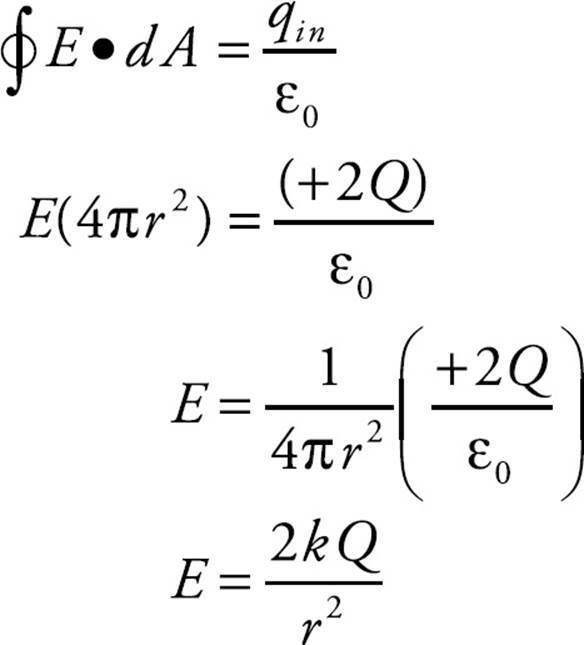 E The electric field will radiate outward from both +3Q and +Q, and the field due to the +3Q charge will be greater because point P is the same distance for both charges. This vector diagram is shown below. The resultant will be in the +x and +y directions. 46. 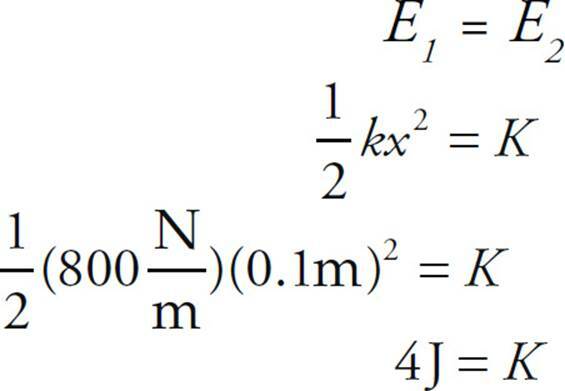 E The electric potential can be calculated using the equation V = . Because there are only positive charges, the electric potential due to each charge will be positive, so the sum cannot be zero. 47. B When the switch S is opened, the equivalent resistance, Req, of the parallel circuit increases. This results in the increase of the Req of the entire circuit. When the Req of the entire circuit increases, the total current, I, must decrease. This is because the total potential difference, V, is constant. The decrease in total I results in a decrease in theV across the 54 Ω resistor. Since the total V has not changed, while the V across the 54 Ω has decreased, the V across the 10 Ω resistor must increase. This results in an increase in the current through the 10 Ω resistor. The current is not doubled, though, because that would require the V across the 10 Ω resistor to have doubled. This would only have occurred if the V across the 54 Ω resistor had halved. That would have required the circuit’s current to have halved as well. This would have occurred only if the 10 Ω had a much greater resistance. 48. 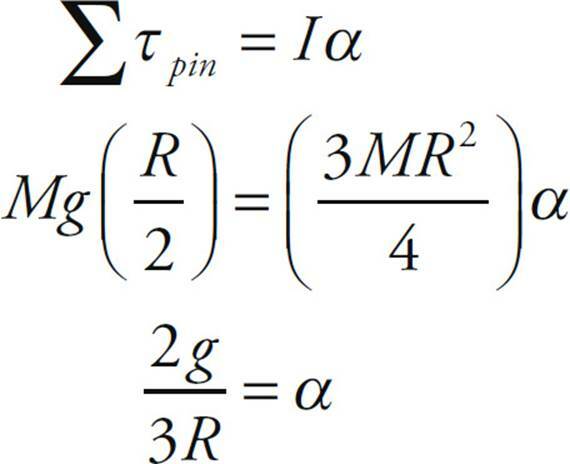 A The equation for the resistance of a wire is R = , and A = πr2. If the length is twice as long, the wire will have twice the resistance and if the radius is half, the wire will have 4 times the resistance per unit length because the radius is squared in the equation. Conceptually this makes sense also because the charge is trying to flow through a cross-sectional area one-fourth as large. These two factors mean the total resistance is 8 times the resistance of wire Y. 49. 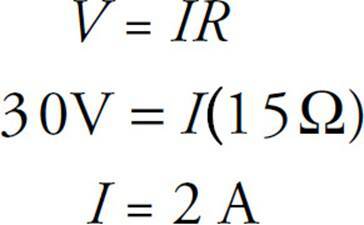 C For the region 0 < r < R the electric potential is constant. For the potential to be constant the electric field must be zero because E = . 50. E The force between two parallel wires is given by the equation , where x is the distance between the wires and ℓ is the length of the wires. Therefore, if the currents are halved the force will be one-fourth the original value. 51. A The area of the square is given by A = ℓ2 = k2t4. Use Faraday’s Law to determine the induced emf as shown below. Since the question asks for the magnitude of the emf, it is not necessary to include the negative sign in your answer. 52. D The potential difference around the loop must be zero according to Kirchhoff’s Loop Rule. The current in the circuit is going counterclockwise if the battery is being charged by the 120 V outlet. A counterclockwise loop starting right below the 120 V outlet will produce the following, 120 – ε – (3)(30) = 0. Therefore ε = 30 V.
53. B Use the right-hand rule to determine that the magnetic force on the charge is directed upward. Therefore the electric force must be directed down, and the electric field then must be down because the electric field indicates the direction of force on a positive charge. 54. C The magnetic field through the loop decreases when the magnet is pulled away. To oppose the change in the flux through the loop, the loop will induce its own current that creates a magnetic field to the right. This will cause the loop to be attracted to the magnet with a force to the left (again to oppose the change in flux). (C) combines these two pieces of information correctly. 55. A Use the right-hand rule to determine the force on each part of the loop. A diagram is shown below with the forces indicated. These forces would produce a torque that causes the loop to rotate about the indicated axis. This would cause the loop to rotate as shown in (A). 56. C Calculate the resistance of the parallel branch first and then add that to the 12 Ω resistor in series with the parallel branch as shown below. 57. A The strength of each charge’s contribution to the electric field at the center of the square is the same for each charge because they are each the same distance away from the center. The electric field due to each one radiates outward from the charge (not outward from the center). The field created by each is cancelled by the field from the charge diagonal from it, so the total field is zero. 58. A The work done will be equal to the change in electric potential energy. The electric potential is the algebraic sum of the potential due to each one, . 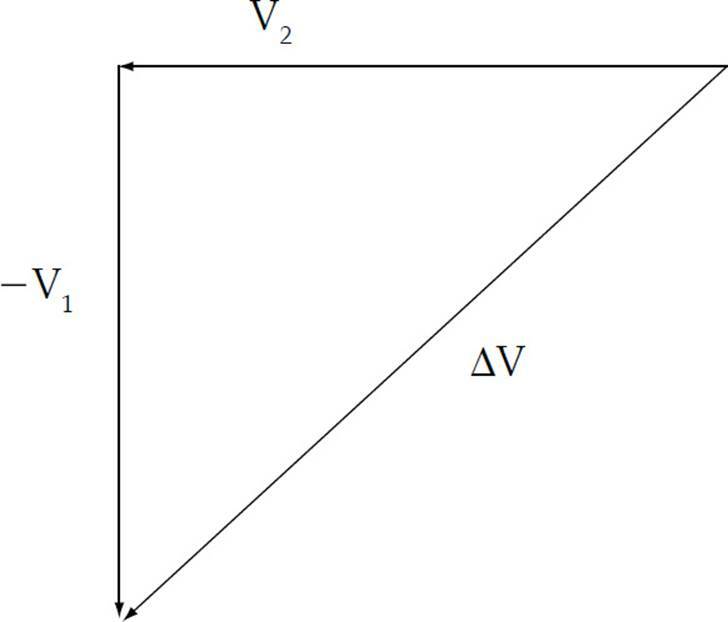 Therefore the total electric potential in the center is V = because they are all positive and the same distance ℓ from the center. The electric potential far away is zero, so V= V at the center. Now relate the potential difference to the potential energy and solve for V.
59. B The strength of the electric field is given by E = . Therefore, the closer the equipotential lines are the greater the strength of the electric field. B is the point where the equipotential lines have the greatest density, so (B) is correct. 60. A The equation relating the electric field to potential difference is E = . The negative sign indicates that the electric field points toward decreasing electric potential. The electric field is also perpendicular to equipotential lines. Therefore (A) indicates the correct direction for the field at point D.
61. E If a negative charge were released from the –10 V equipotential line it would want to travel to a higher potential, so when it goes to the 20 V line it must be losing electric potential energy. This means the answer should be negative: eliminate (A), (B), and (C). We can also use the definition of electric potential to solve for the value of U. 62. 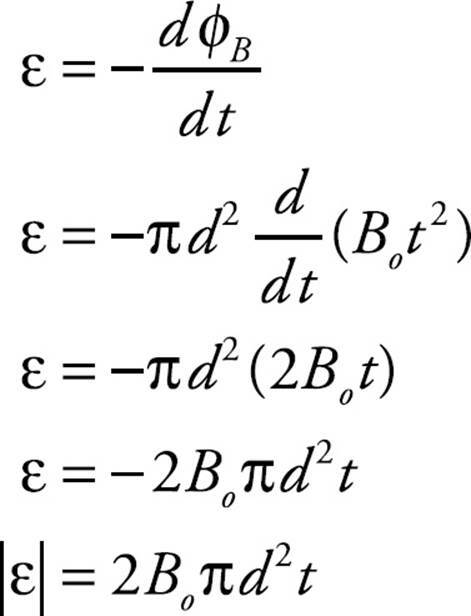 D Maxwell’s equations relates electric and magnetic fields. A changing electric field would create a changing electric flux, which in turn would induce a magnetic field. This is Ampère-Maxwell’s Law, which is (D). 63. B For this circuit, R would change how long the capacitor took to get charged, but would not alter the capacitance or the charge on the plates. Therefore any answer that changes R will not be correct, so (A), (C), and (E) can be eliminated. The capacitance of a parallel plate capacitor can be increased by increasing the dielectric constant K, increasing the area of the plates A, or decreasing the distance between the plates d. If we increase V, more charge will be stored on the capacitor. Therefore (D) would certainly increase the charge stored and can be eliminated. (B) is correct because decreasing d would increase the capacitance and we could decrease V such that less charge would be stored on the capacitor even though the capacitance increased. 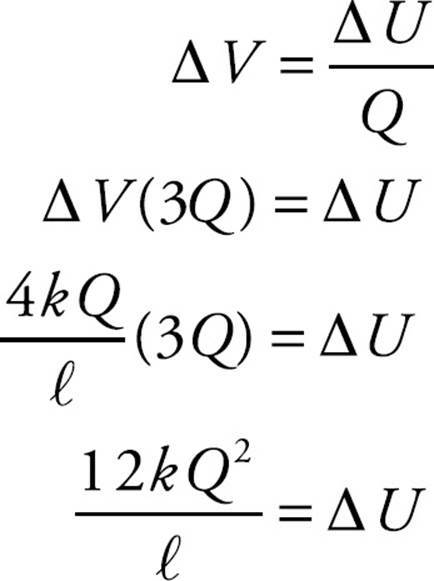 Furthermore, Q = CV, so V must decrease when C increases in order for Q to decrease. 64. B Use the right-hand rule to determine the direction of the magnetic field due to each wire. The magnetic fields due to F and G cancel because the one due to F is out of the page at point P and the one due to G is into the page at point P. The field due to wire H is out of the page, so (B) is the answer. 65. D For a solid, metal object the electric field inside is equal to zero. The electric field outside the object will not be zero because some excess charge is contained on the object and Gauss’s Law can be applied to show that Qin would generate an electric field. This information eliminates (A) and (B). The surface of a conductor is an equipotential, so (E) is not correct. The strength of the electric field should decrease as the distance away from the center increases, so (C) is not correct. 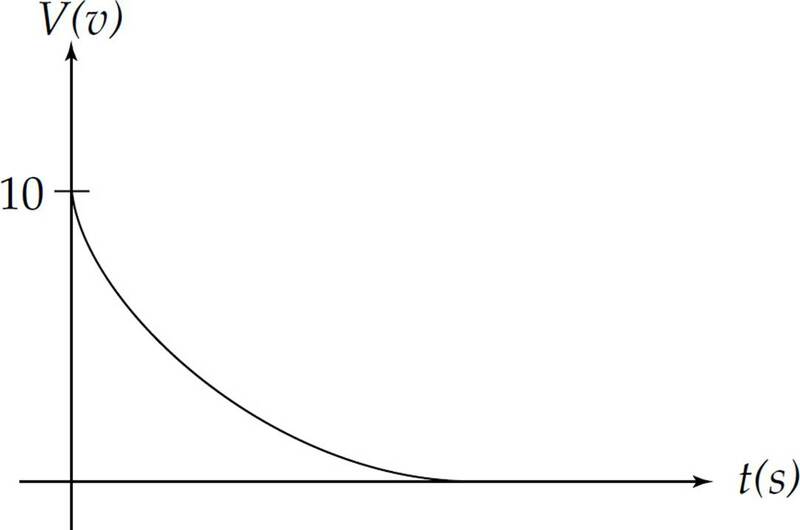 (D) is correct, and we can apply Gauss’s Law as shown below to the odd-shaped figure as indicated. The Qin will be equal to the surface charge density at the location times the area of the endcap of the Gaussian cylinder. This is only true very close to the surface of the object so that the Gaussian cylinder is perpendicular to the surface. 66. E Because the switch is closed after being open for a long time, the inductor will not have to oppose any change in current from the resistors in the circuit. Therefore the potential difference will be 12 V, or choice (E). 68. E The electric field will decrease as when r > R. This eliminates (A), (B), and (C). 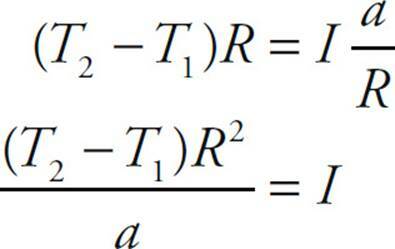 When ρ is constant for a spherical charge distribution, the electric field strength varies linearly with r for r < R. Therefore, if ρ increases with r, as in this problem, more charge is being contained as r increases. 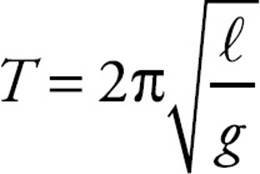 This will make the electric field increase less rapidly than if ρ were constant. Therefore (E) is correct. 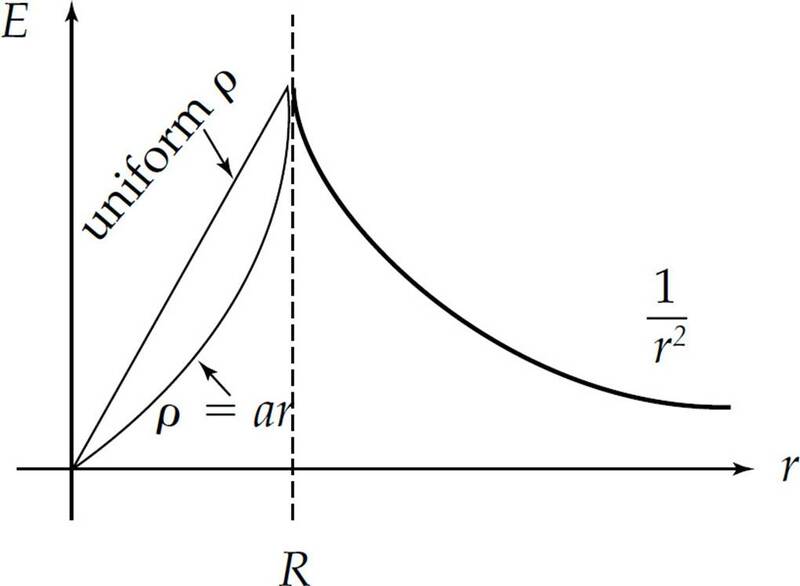 The general shapes of E vs. r for a uniform ρ and our problem are shown below. This sketch assumes the total charge is equal for both. 69. B For figure II, the electrons in the finger are attracted to the rod and will go from the finger into the electroscope. Therefore (B) is correct. 70. C This is essentially a Hall’s voltage question. Use the left-hand rule to determine the direction of the magnetic force on the electrons traveling to the left in the diagram. The force is downward, which means the potential at X will be positive and the potential at Y will be negative. Therefore (C) is correct. 1. 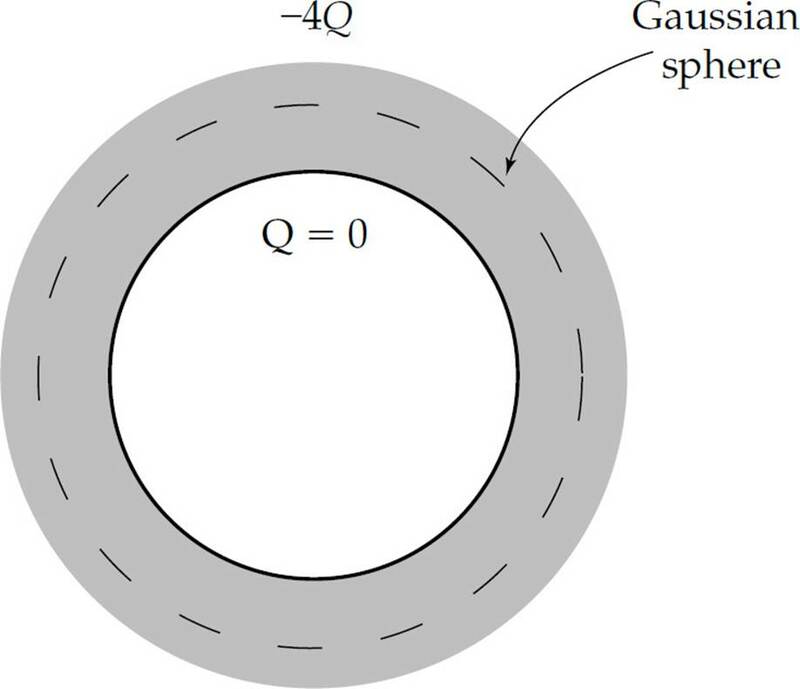 (a) (i) Consider the Gaussian sphere shown on the next page as a dashed line. Since the electric field is zero inside a conductor, the charge enclosed must be zero. Therefore the charge on the inner surface is zero. This leaves the –4Q charge on the outer surface, as shown below. 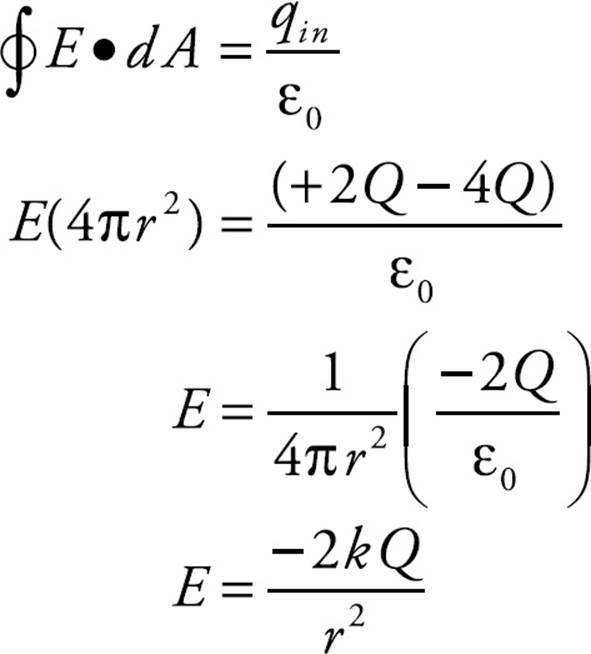 (ii) The electric field inside a conductor at equilibrium is always zero, so the electric field in region II is zero. Field lines originate on positive charges and end on negative charges. Since there is no excess charge on the inner surface of the sphere or within region I the electric field in region I is also zero. The electric field in region III is shown below. 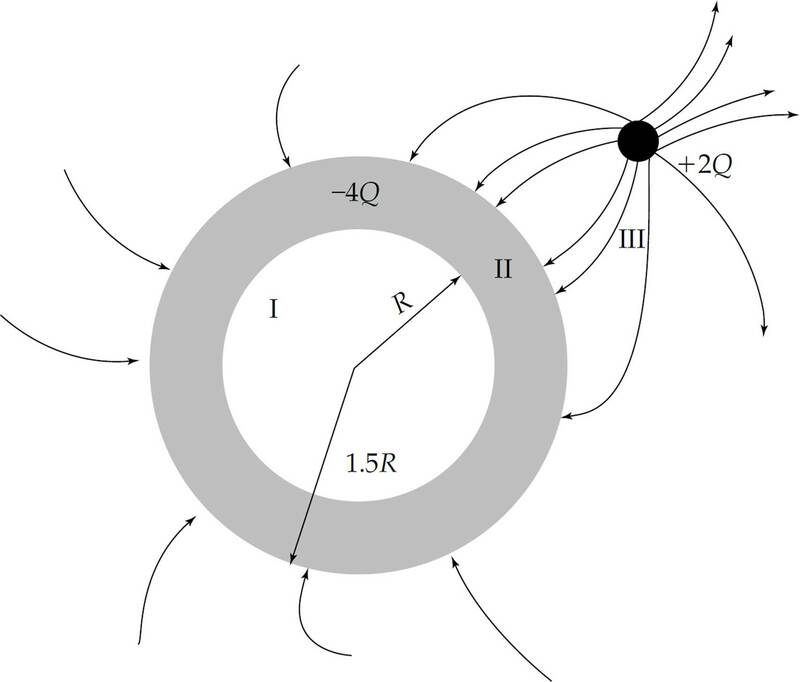 The electric field lines will originate at the +2Q charge and terminate at the outer surface of the spherical shell because the outer surface will have a charge of –4Q. 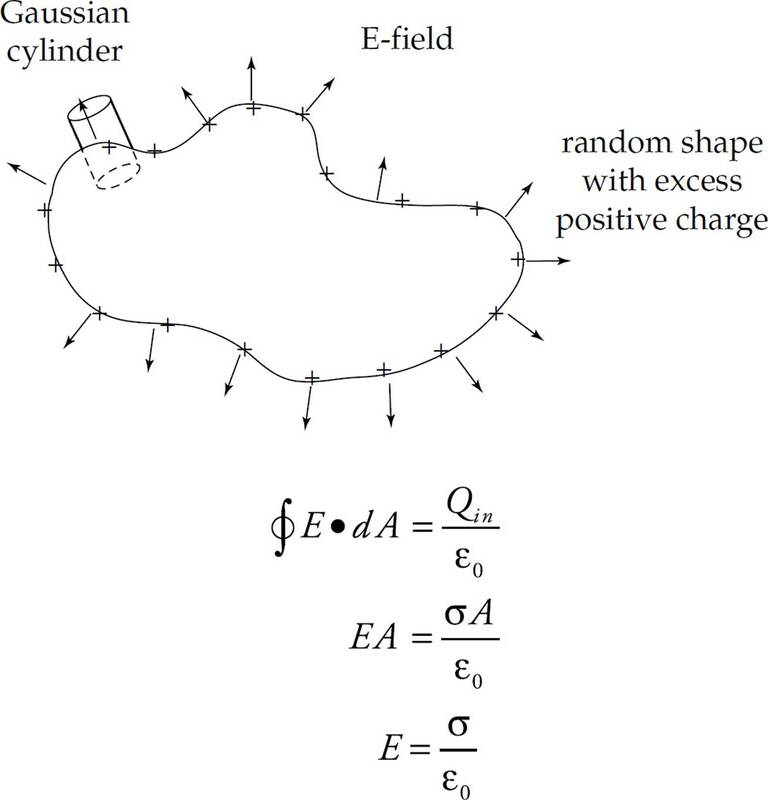 Some of the –4Q charge will be closer to the +2Q charge, but that still leaves an excess of negative charge around the rest of the outer surface of the shell, so the field lines should be ending on the outer surface. All field lines need to be perpendicular to the surface of the shell. 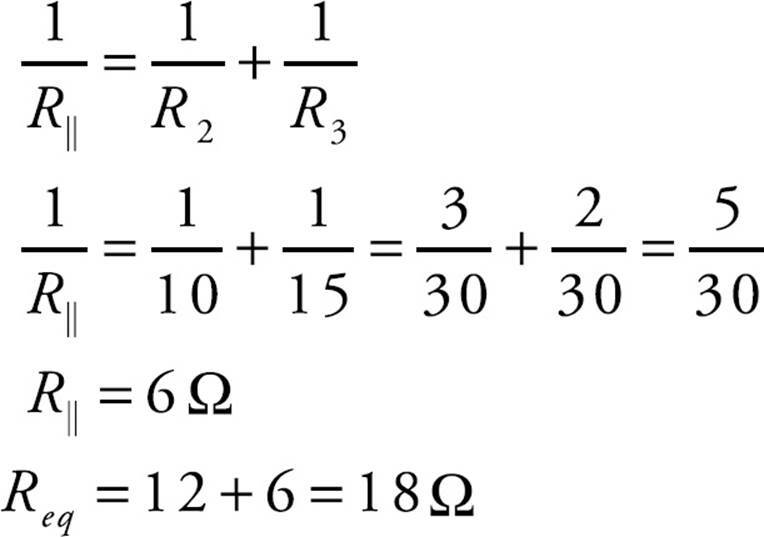 (b) Use Gauss’s Law for each of the radii. The surface area of the Gaussian sphere is 4πr2, so . Also substitute = k to simplify the expression. (ii) E = 0, within a conductor. 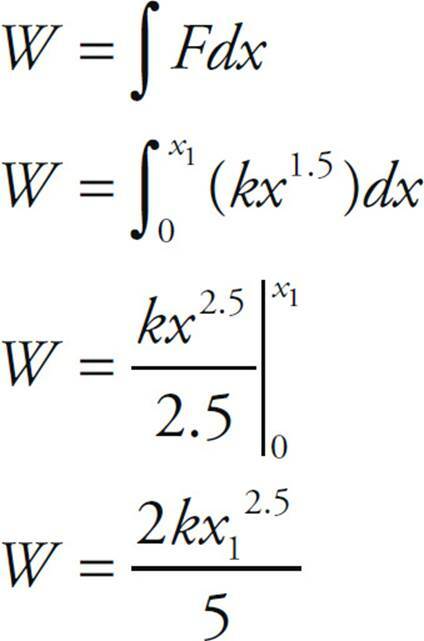 (c) The potential difference can be calculated using the equation as shown below. 2. (a) When the switch is first moved to position A the 50 µF capacitor is acting like a wire because it does not oppose the current when it is uncharged. The current through the 20 Ω resistor is the same as the entire left side of the circuit because it is a series circuit. Use Ohm’s Laws to solve for the current. (b) The initial voltage across the 10 Ω resistor can be calculated using Ohm’s Law. For an RC circuit the voltage across the resistor will decrease exponentially because the current decreases exponentially as the capacitor is charging. The sketch of the voltage is shown below. (c) When the switch is in position A, the capacitor will continue being charged until the voltage across the 50 µF becomes 30 V, which will happen after a long time. When the switch is moved to position B, the 20 µF capacitor acts like a wire because it is uncharged. 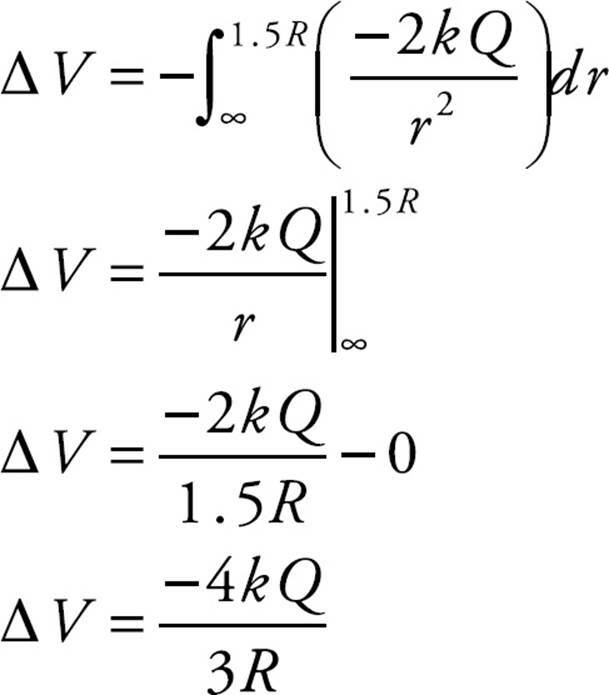 Use Ohm’s Law to solve for the current through the 15 Ω resistor immediately after the switch is moved to position B. When the switch is moved to position B, this charge will distribute between the two capacitors until the system reaches equilibrium. The voltage across each capacitor will be the same when the system is in equilibrium. Use this information and the fact that for a capacitor. 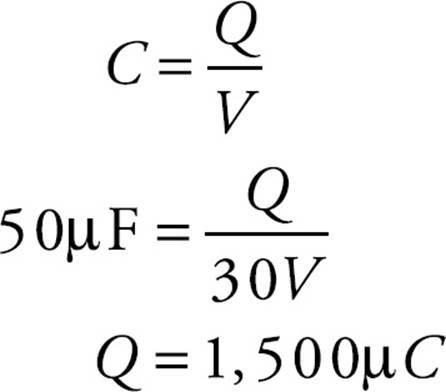 Let q be the charge on the 20 µF capacitor, which means 1,500 – q is the charge on the 50 µF capacitor. 3. (a) The magnetic flux is the dot product of the magnetic field and area vector that the magnetic field goes through. For this problem the area goes out to a radius d because the field does not go out to the radius of the loop. (b) Use Faraday’s Law to determine the induced emf. We will ignore the negative sign in the final answer because we only need the magnitude of the emf. (c) Lenz’s Law states that the induced emf will produce a magnetic field to oppose the change in the external magnetic field. The external magnetic field going into the page is increasing with time, so to oppose the change in the external magnetic field the induced current in the loop will create a magnetic field out of the page. To do this the induced current must be counterclockwise. (d) Power is the rate at which energy is dissipated. Power for a circuit is given by the equations p = iv = . We will use for power since we know the voltage and the resistance.